Chapter 1 “What Do We Mean by Sola Scriptura?” by Dr. W. Robert Godfrey. Chapter 2 “Sola Scriptura and the Early Church” by Dr. James White. Chapter 3 “The Establishment of Scripture” by Dr. R. C. Sproul. Chapter 4 “The Authority of Scripture” by Dr. Derek W. H. Thomas. Chapter 5 “The Sufficiency of the Written Word” by Dr. John MacArthur. Chapter 6 “Scripture and Tradition” by Dr. Sinclair B. Ferguson. Chapter 7 “The Transforming Power of Scripture” by Dr. Joel R. Beeke, and Rev. Ray B. Lanning. “Afterword” by Dr. Don Kistler. I appreciated the manner in which they dealt with all of the subtopics. Each expert did a fine job of astutely presenting the information. Unlike so many modern works, there was a bibliography at the end of each chapter, displaying their scholarly due diligence to cite source texts. The book was just long enough to be helpful, and not so long as to lose the laymen in the tall grass. I would definitely recommend this book to your Christian library. It will aid you, and it is a great resource to lend out to friends, and family who may be unsure of what to think on the topic of sola scriptura. 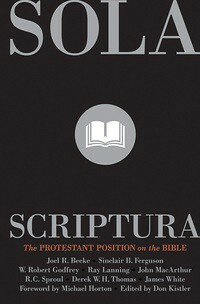 It is a great primer on the topic of sola scriptura. You will learn what it is, and what it isn’t. You will learn how we arrived at the conclusion, and why it is the right one. If you are a questioning Catholic, it could help answer some question for you, as to why your Protestant friends believe what they do, and maybe even convince you. It isn’t just for questioning Catholics either, you could give it to anyone who is in a false religion that relies on extra-biblical sources, and traditions for their doctrinal authority e.g. Mormons, Jehovah’s Witnesses, Eastern Orthodox, and many more. The book is published by Reformation Trust. It is available on the following sites; Amazon.com Christianbook.com, and Reformation Trust Publishing.